The Webster University, Westminster College (Mo.) and Fontbonne University (Mo.) men’s soccer teams are tied at 7-1 for the No. 1 spot in the St. Louis Intercollegiate Athletic Conference. Barring an upset on Nov. 2, the final day of SLIAC games, Fontbonne would win the tie-break and was awarded home-field advantage in the SLIAC Tournament. The Gorloks defeated Westminster 1-0 on Oct. 29 to give the Blue Jays their loss in the SLIAC. Freshman forward BJ Dryer corralled a cross from junior midfielder Jeff Wallner, then beat a defender to net his fifth goal of the season. The three SLIAC teams tied at the top of the conference play and will play the three teams on the bottom for their last games of the season. Blackburn College (Ill.), Iowa Wesleyan and Eureka College (Ill.) each have one win in conference this year. Webster Men’s Head Coach Michael Siener said he expects the SLIAC leaders to take care of business and force a shared title for the conference’s No. 1 team. If Siener is correct then this will be the second time in his coaching career his team has tied for the best conference record. 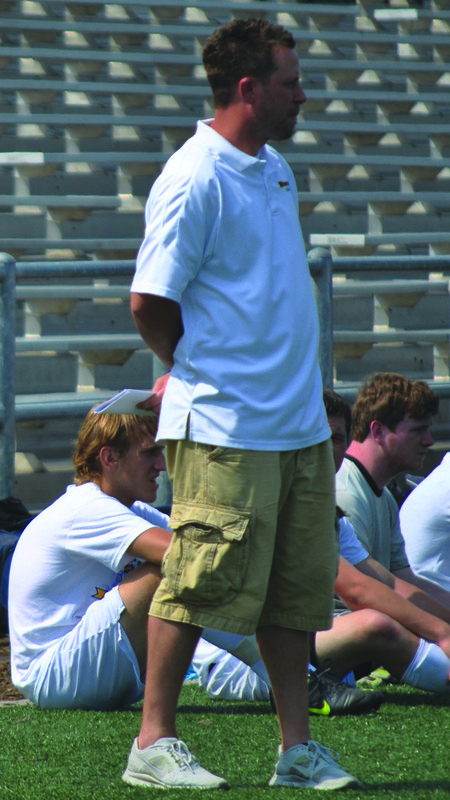 The previous was the 2012 men’s tennis season, which Siener is also the head coach. Webster ended up losing in a coin flip. “It’s just not fair and not how it should be decided,” Siener said. If Siener’s predictions hold true then the host team for the conference tournament would be decided by who the fourth seed is. In SLIAC tie-break rules the winner is decided by a series of rules listed on SLIAC’s website. The rules are used for every sport in the conference but he said the rules are unfair to the soccer teams because they don’t play every team twice. In the tie-break rules, wins as the away team are considered higher wins than those at home. The soccer schedule only allows teams to play each other once, unlike sports like volleyball and basketball where each team plays twice, once at home then on the road. Fontbonne and Westminster had an advantage over Webster from the beginning of this season because they were scheduled one more away game than the Gorloks, thus a chance at more points. Siener said this problem just wasn’t brought up at the SLIAC coaches meeting at the beginning of the season. Seiner said he expects there to be a change next season, but he is just glad the conference has a system in place to make the changes year-to-year. Junior defender Josh Papes and junior forward Carlton Poindexter were on the 2012 tennis team. Papes said losing home field advantage won’t hurt the team in the tournament. Webster lost their first game in conference at Fontbonne in a 3-0 loss on Oct. 19. Greenville is currently the four seed and with a win Saturday against Principia College (Ill.) would make Fontbonne the home team. Webster can be awarded home team if Greenville loses and Spalding wins or if Fontbonne losses.